Since I talked about the importance of showing authentic emotions on Monday, I wanted to talk about how to actually do that in your writing. I'm by no means an expert on this; I'm still learning a lot about how to not only portray the emotions your character is feeling, but how to get the reader to feel them too. We all know the rule of not telling: "I was sad" just doesn't cut it. So what do we do, then? I recently read 13 Reasons Why by Jay Asher and it packed an emotional wallop I won't soon forget. I figured we could do some analyzation today. So, first step: read the first chapter here (click "Look Inside" over the graphic). It's only four pages, and it'll help the analysis below make sense. Now, let's take a look at the techniques Asher uses to get the emotional ball rolling right from the get-go. The simple use of the word "repeats" is brilliant. It implies that Clay, the main character, was not listening. His mind was distracted enough that he didn't answer a direct question. Immediately, before we even know what's happening or even the main character's name, we know that something isn't right. A character's internal thoughts are one of the biggest and most helpful things for portraying their emotions. This is also a big place for reader's to connect to those emotions. Most of the time when we think, it's not in blatant terms. For example, where Clay could have been thinking, "I hope Jenny gets this and it hurts her as bad as it did me," we get instead a few lines of him wishing he had waited to send the package so Jenny could have another day of peace-- though she doesn't deserve it. This train of thought is natural, and it does several things at once. We understand Clay himself is not at peace because he knows Jenny won't be at peace either. And we feel the bitterness in the final line. She doesn't deserve peace. Does he? Guilt and sorrow well up from those lines, even though the words themselves are never mentioned. This is the most common way for most writers to show their character's emotions. Are the shocked? Let their mouth drop open. Are they irritated? They cross their arms and tap a finger on their elbow. The problem with this is overdoing it. I use it like crazy in my first drafts, and have to go back and do a lot of revising. Because if you use these too much, they become cliche. But you can't deny that emotions do have a physical effect on us, which is why physical beats are still an effective tool. In Clay's case, he has a headache. And again, the author doesn't just say, "his head pounded with the pain." In the second line, Clay rubs his forehead and comments that "the throbbing has become intense." We know he hurts physically, and it mirrors how he hurts emotionally. This is another powerful tool. Don't let the name deceive you, though; it's about more than just what you see. An image can involve many senses-- in fact, it works well if it uses more than one. But images also work best if they're fairly simple, so don't overcomplicate things by throwing in too many sensory details unless the situation calls for it. In the last few paragraphs of chapter 1, Clay imagines the path he feels he can barely walk that leads to school. It zips past like a camera zooming in on something, until at last we see the object: the empty desk of Hannah baker. Because of the technique used, and the building of emotions up to this point, the image of the empty desk is haunting to the reader, because we know it is what haunts Clay. It's the focus of his pain, the reason behind this mysterious package he has sent. One simple image clarifies the situation behind his pain, just a bit, so the reader can empathize. We understand. And once we understand, that's when we hurt, too. This is the last key to getting your reader to invest in your character's emotions. They have to understand. They need information on WHY your character feels this way, even if they barely have a glimpse. So, my friends, what techniques to you use to show character's emotions and get readers to care? Have you read 13 Reasons Why (you really, really should)? What books do you love that helped you feel the character's emotions? I haven't read that book but my best friend did and loved it. I've been meaning to pick it up but haven't really had the time. I just finished a book called Angel Burn by L. A. Weatherly and that was amazing! The pacing was very good and the story was intriguing! That book has given me so many more ideas! You're awesome, Shallee! I learn so much from you. There's no point in telling a story if no one cares about the characters. And the only way to do that is through connecting us emotionally. great post and great examples. I loved that book and Jay Asher did a fabulous job of making me care about Clay and mourn for Hannah and what was lost. This is an awesome, well-organized post. Very informative! Brilliant analysis! I love that. I LOVED LOVED LOVED this book :) You have great analysis. Thanks for the breakdown. Excellent analysis. I often don't even think about how I squeeze the emotions into my writing. I need to do that, clearly! This book knocked me over. You're right--Asher does an incredible job of investing us in these characters. Love your advice that the reader has to understand the characters to empathize with them. You're awesome! Thanks for the great post! Yes, I loved 13 Reasons, though a ton of my friends just couldn't handle it. It was intense, and Jay Asher did a great job of making me care. Fantastic post with lots of helpful detail. I fear I don't do a good enough job of this, which is lame because my story BECOME is very emotional - supposedly. ;) Anyway, I still have not read this book, but I want to - that first chapter is awesome. This is a really fun post! It's got me thinking about all the techniques I use. So much fun. 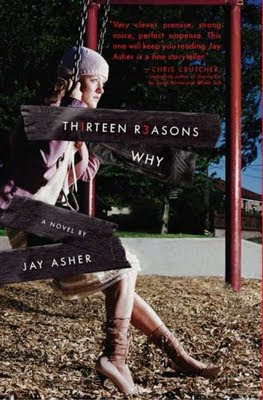 I have heard so much about Thirteen Reasons Why, and your post with its great analysis has made me eager to read it. This is something that haunts me when I write. I never know if I'm conveying what I want to convey, or whether what I'm writing is just trying to force emotion from the reader (even though the reader is always just me, I still have a high standard :P). I haven't read all of the entries of your blog, but what I have read so far has been most helpful. Do you have any advice for getting a better grasp of the language you're using? My English has been steadily getting worse, and I feel like my sentences are very wooden. Sara, welcome! Glad you've enjoyed the blog. A great way to see if you're conveying the right emotion is to find a critique partner and find out what their reaction is. Critique partners are also a great way to help make your language stronger. The biggest help for me with language is to read as much as I can. Try reading in different genres, and even pick up some poetry. Poets are fabulous at putting their ideas into tight and beautiful language. Hope that helps!